The time this year seems to have flown by. With Mum being ill and eventually passing away left me with plenty to do. I know it not an excuse however sometimes I just wasn’t interested in fishing. Then I think you get out of the habit and before you know it, it’s March. That’s the feeling I defiantly had as Andy (you should have been here yesterday) Cowley and I met on the banks of the H Avon for the penultimate days fishing. 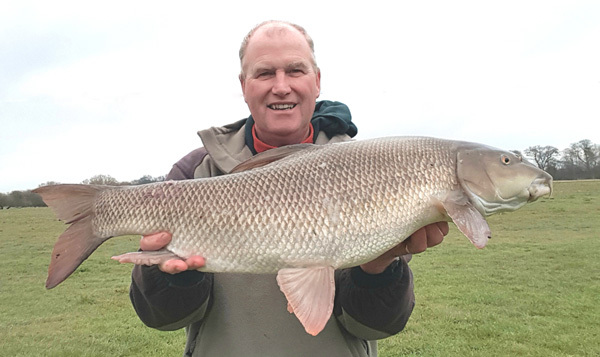 The water temp had been rising and a few barbel had been coming out and since I had been unlucky with the chub I decided to concentrate on some barbel fishing. 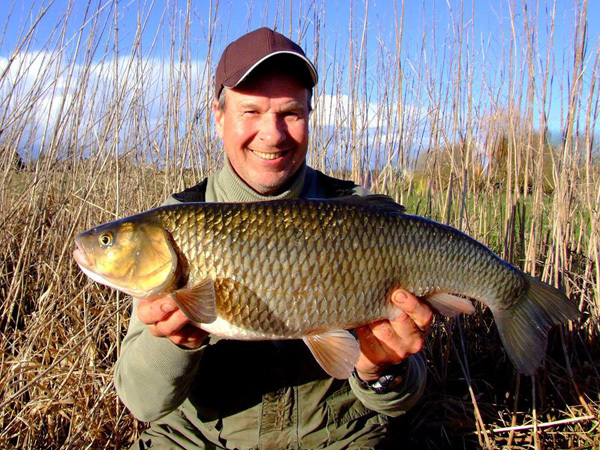 For me I don’t normally fish for barbel as I really appreciate the large chub in the river. So I decide to fish a slacker part of the river where it forms a pool and normally a few chub and barbel are around. I was using a boilie with a small PVA bag of crushed ones as an attractor. I used 2 rods to cover a couple areas of the pool. Only casting our every hour or so was a bout right as I didn’t want to put too much feed in the swim. After about 2 hrs the tip rattled once then whipped around in that 3 ft twitch that had me on the rod and playing an angry barbel. 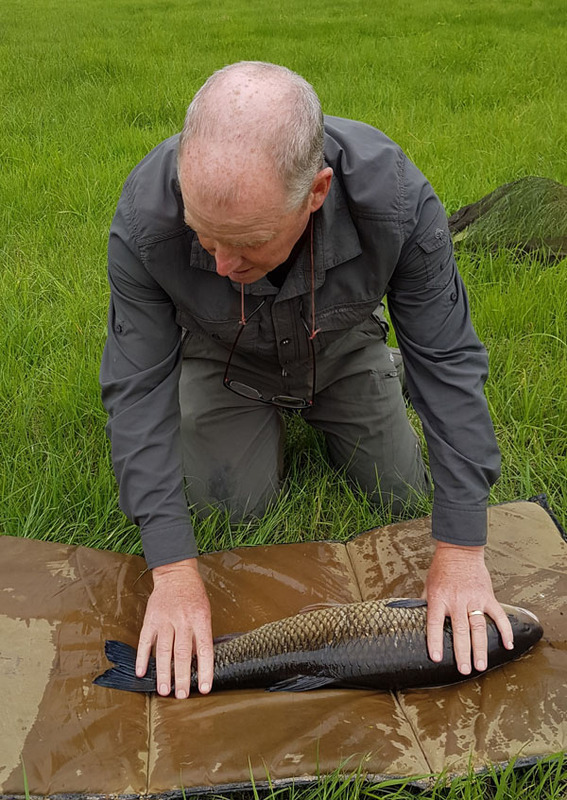 I was using my normal 1.75 t/c rod and in the flow it gave me an excellent fight going to the far side of the river in the strong flow. Here it held steady and very begrudgingly started to come across to mid river. Then it used the flow to start to move downstream where there were few slacks to land it. So I applied a fair amount of pressure to get it in the slacker water in front of me. Once here I could dictate the fight and really I had it beaten. As she slipped into the net I though it was a good double and was pleased to see it go 12lbs 7oz. I was pleased that at least I wasn’t going to blank. The photo’s were taken and back she went. A quick phone call to Andy found him struggling to catch much in many of the swims that had produced before. I was then in two minds whether to stay or move swims and after another hour fishing I moved to another swim I had fancied. A quick chat to Dave Charles had me heading back to the swim as he thought there could be a few barbel in there. Now if anyone knows then Dave’s advice is normally sound advice. So I headed back and found the swim vacant so I cast out for the afternoon. Throughout the day I had a few chub bangs but no hook-ups. For the last hour or so Andy came down we had a chat and he disappeared to a swim upstream where he promptly caught another 6lb chub. He really is a big chub magnet. I had a couple of knocks and hooked one chub of about 4lbs and that was it. We were stopping over in Fordingbridge for the night. So we got home changed and headed off to the pub for a bite to eat and a pint. We retired to bed for the night early as we had both been up early and we thought we would be on the river at 7am to beat the rush on the last day of the season. What rush, we arrived at 7am and no cars were in any of the car parks. 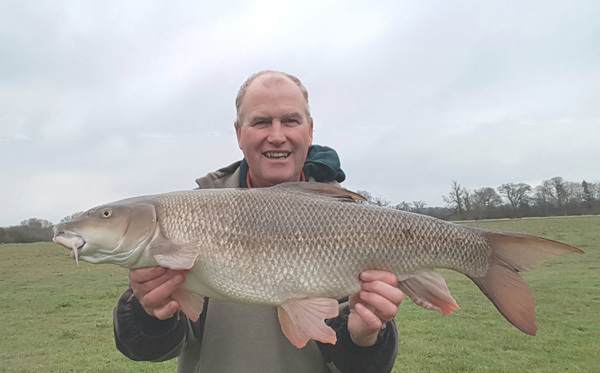 Andy started float fishing again while I returned to the same swim as yesterday where I had caught the barbel. It was a very windy but not cold wind, but a cool enough to put the brolly up. I fished all day again with just a few chub pulls on the rod top but nothing else. So a very uneventful last day of the season for Andy and myself. I’m pleased to see the back of the river season. My focus now turns towards the spring and tench fishing and perhaps the odd session fluff chucking. It’s been a great season for both Mark and Andy on the river we all say we are so privileged to be fishing the stretch we do. We never take anything for granted and support each other with info as we all live 60 miles from the place. I’ve not got a fish to show but these are two of my favorite photo’s for the year. This entry was posted on Sunday, March 18th, 2018 at 6:55 pm	and is filed under Uncategorized. You can follow any responses to this entry through the RSS 2.0 feed. Both comments and pings are currently closed.